Car seat belts anchors test-bed is aimed at car seat belts anchors strength testing test equipment, automobile vehicle is to ensure the safe and reliable operation of the indispensable test equipments. GB14167-1993 "automobile safety belt mounting", GB15083-1994 the car seat strength requirement and test method ", GB 13057-2003 "seats vehicles and fixing parts of the strength of the standard requirement strength test, static test. Digital multi-channel collaborative all closed-loop computer real-time control. But many actuators and testing, multi-channel also test. Simulation, real-time measurement process seat loading of experimental parameters. 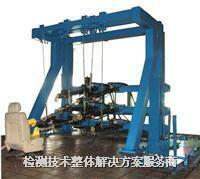 The software adopts the latest virtual instrument technology, actuator movement all software control. The software used in Window98, Window2000, WindowXP operating system.